I have been mad busy. Mostly, Ive been bullshitting and haven’t been budgeting my time right. Also, I have a co-teacher. Well, she’s not a co-teacher as much as a substitute. In order to complete my degree (M.A. in Special Education & Education Specialist Credential), my last Principal was able to secure a position (for 1 semester) as an Inclusion Specialist. Once the semester is over, I will go back to my classroom and finish out the school year, with the position becoming permanent next Fall. So, for the past two weeks I’ve been training my co-teacher. Can I just say that it is so scary leaving another teacher in charge of your students? It was almost as scary as leaving my own children at school. I had to learn to let go really quickly and appreciate her strengths. I can only hope that she comes through. I’m behind in lesson planning, so I will say good-bye and post the rest of the story at another time. I will add more as I find them. Bye for now!!! I am back at work. Since I have a co-teacher (I’ll explain in a later post), I was able to set up my classroom in one day. I forgot the lettering at home, so I just need to put up the lettering and the posters at the top of the room. I packed so much into today and this summer. Usually I’m a big, fat slacker in the summer. But, I was determined to make the most of this summer & I did. I spent so much time with my children, I finished 1/2 of my final classes. I decided on a topic for my Literature review (Inclusion) and I read many of the books for my summer reading list. I had such a good summer. I’m sad to see it end so early, but it was good while it lasted. Now, I will see you later. I’m off to LACMA’s Friday night jazz. Works4Me is a free weekly e-newsletter, showcasing practical classroom tips written by the readers themselves. For over 10 years we have been gathering great ideas from the real experts, educators like you. Here they present you 21 of the best back-to-school-themed teaching tips we’ve gathered over the years. With this get-to-know-you activity, Ms. Herbert’s fourth-grade students practice their conversational skills, learn proper etiquette, and discover just about everything they ever wanted to know about their new teacher. 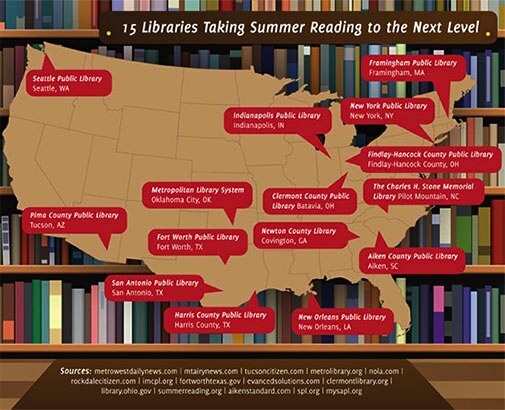 Summer reading programs have long been a staple of library activities in communities all across the nation, yet many libraries today are offering much more than the usual programs that encourage young kids to read by tracking their progress and offering rewards. Today, many reading programs are accompanied by seriously cool reading and education-related events and there are numerous reading programs targeting adults and teens, pushing whole families to enjoy a few good books over the summer months. 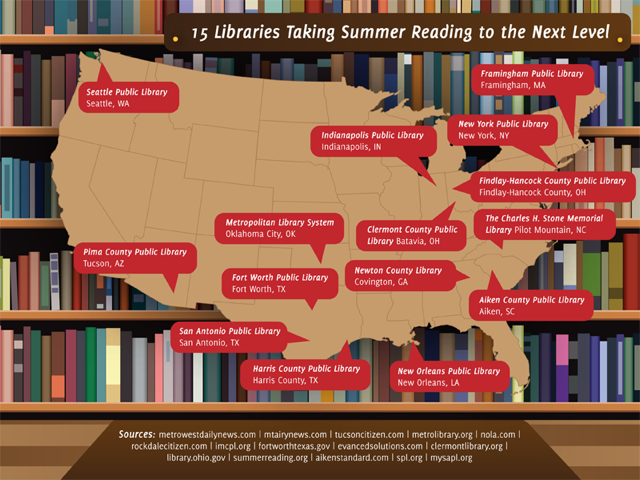 While not an exhaustive list (there are a lot of amazing libraries out there), here we highlight some of the libraries we think are going above and beyond in their summer reading initiatives, offering programs and activities that help readers spend their summers reading, learning, sharing, and growing. Framingham Public Library has a great summer reading program for keeping young minds engaged during their break from school, but where it really stands out is in what it has to offer adults. In recent years, the library has developed summer reading programs that target adults, offering additional entries in a raffle for every book they read. Readers log their books, which are of their own choosing, and at the end of the summer can get a chance to win a grand prize: a new Kindle. The library also sponsors other adult-focused events over the summer, including screening foreign films and hosting lectures on topics like super heroes and mythology. When kids sign up for the summer reading program at this North Carolina library, they get a whole lot more than just motivation to read. The library has incorporated a number of fun and exciting events into their summer reading program. These include a mobile space lab, yoga classes for kids, magic shows, nighttime parties for tweens, and plenty of fun activities for teens. Kids of any age can also compete to see who can read the most books, with a cash prize to the winner.